The Waggle Dance is something bees do to communicate with each other. Read all about this strange dance in this worksheet. 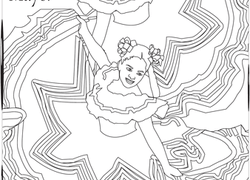 Learn how to dance the Charleston with this interactive coloring page. After you color the dancer, check out the dance steps on page 2! Color in this disco dude, and on page two, learn a disco dance. Irish dance has a rich history. Celebrate this wonderful piece of Ireland's culture with this festive coloring page. 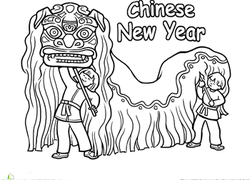 At Chinese New Year parades, participants often celebrate by building dragon and lion characters to dance under. How many dancers are under this dragon? Frankenstein's monster, who is alive and well, ready to dance the night away! Why Sit Still When You Can Dance? Whether your kid's a dancer or not, this printable poster is a great way to remind them that life shouldn't always be taken with a straight face. This Alvin Ailey biography will teach kids about this amazing, influential American dance artist. This Cinco de Mayo coloring page features two women wearing beautiful dresses performing a traditional dance in celebration! This football player looks like he's getting ready for a victory dance! Do you think his team won? 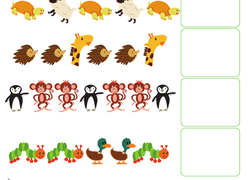 In this worksheet, help Darla dance the number line with filling in the missing numbers! 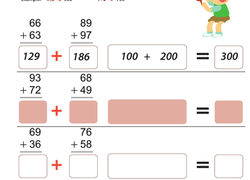 Your first grader will get into the rhythm of the addition beat and dance her way to arithmetic mastery as she completes this colorful math worksheet. Dance an Irish jig as your second grader practices spelling some St. Patrick's Day words! He'll choose the correct spelling out of each group. Your child can dance his way to arithmetic success with this cheerful 2nd grade addition worksheet that includes lessons in analyzing place value and rounding. How does Danny dance and Rumi run? Test your second grader's adverb know-how by challenging them to think of an adverb to describe the actions in this worksheet. After learning this super easy rule for how to use possessive apostrophes, students will gracefully dance their way through any expression that shows possession.